If you’ve been puttering along on this blog for a bit you will be aware that our Summer has been a bit of a no-show, a non-event, AWOL even….. I’ve whined about it here and there and it has been the subject of endless comments between myself and the lovely Alys and several others. My gardening plans for the past three or four months have also been no-shows, non-events and AWOL – I was too busy painting, or it was raining, or, or, or – and nothing got done. 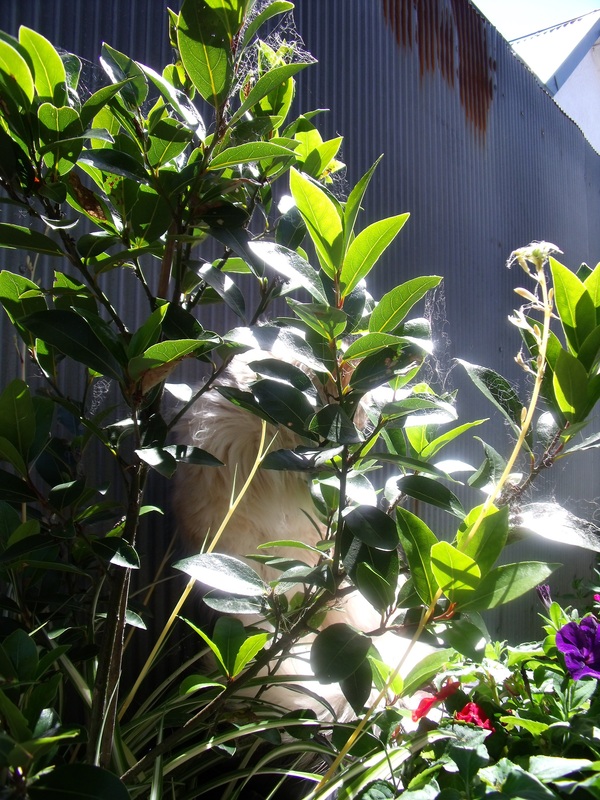 Poor Sid presided over a random collection of raggedy – desperately in need of a good haircut – climbers and a motley crew of assorted dead or dying herbs, perennials and wild flowers and his meditative Guardian Cat was weighted down by the neglected sprawling of a lavender gone wild. The spiders were having a field day and spinning webs from one side of the courtyard to the other and growing extremely large on the bounty that was thereby captured. 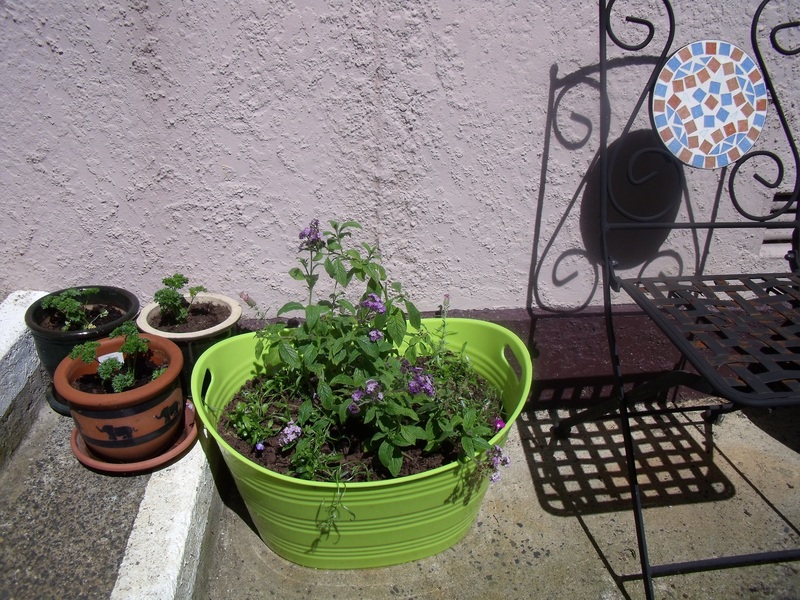 The pots sported a random assortment of dead plants and sprouting weeds. In short my beloved pocket handkerchief outdoor space was a woeful sight and I was feeling somewhat ashamed of myself. However, as we know, all things pass and finally – some two months after it disappeared, Summer has returned to us. It has shown up hot and heady and rarin’ to go – better late than never, I said happily. And so, on a warm and sunny morning, with the help of my YD who is enjoying two weeks vacation from her highly intensive job, we decided to set to it, fix it up, return it to a fraction of its former glory and give it a do-over. I was thinking to just have a tidy up, a clean up, to make the best of a bad thing and let it go this summer. YD had other ideas and reminded me of my wish to do something with the inspirations received from the blogs what are writ by the likes of the previously mentioned Alys and Narf7 and Wendy and Robbie – ‘Better late than never’ she said. So off we went to Bunnings. Bunnings has become her favourite store since the Outdoor Entertainment Area adventure – which I must mention to you, my dear friends, I have still have not spent an evening in due to the inclement conditions of our Yuletide Celebrations and subsequent weeks. The rain would have been okay but the bitter cold and howling southerly winds were quite another thing to deal with! I also purchased two brightly coloured plastic containers that look like quite deep baby baths for $4 each and two super dooper large bags of organic compost mix with the bio-grow stamp of approval. Back in the courtyard we maneuvered carefully around each other and the assortment of goodies and began the cleanup. It didn’t take long, the whole thing is no larger than six pocket hankies sewn together. The dead matter was pulled, the soil turned and composted and the colourful tubs had holes vigorously punched into their up-turned bottoms and were also filled with soil and a goodly amount of compost and the seedlings all transplanted into them. 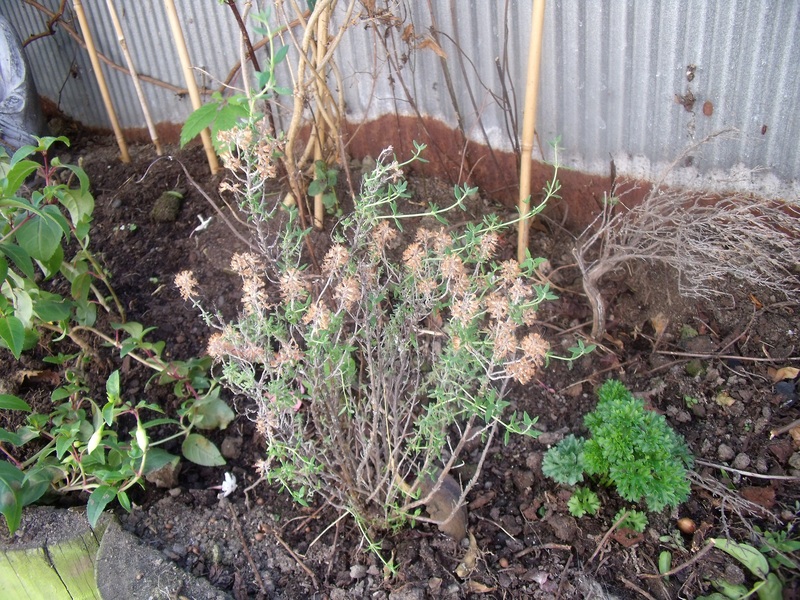 Sid was given care of the three wild thyme plants I had filched whilst up in the high country just before Christmas. He seemed to be somewhat thoughtful about that …. The existing furniture was given a wash down and any remaining spiders hastily moved on to find new places to spin their webs. An hour later it was all done and I was waiting for the sun to go down so I could give everything a good drink. The bumbles were already dropping in to say hello and then were buzzing off again to spread the word – good times have come, good times have come!!! Orlando, who had watched the whole frantic debacle from the safety of the conservatory, refusing to come out until the place was all tidy and ship-shape again. When at last he did emerge, he just as quickly disappeared again. If you still can’t see, click and click again and peer past the assorted webs to the far side…. Just the perfect place to get a bit of Vitamin D in the late afternoon sun! 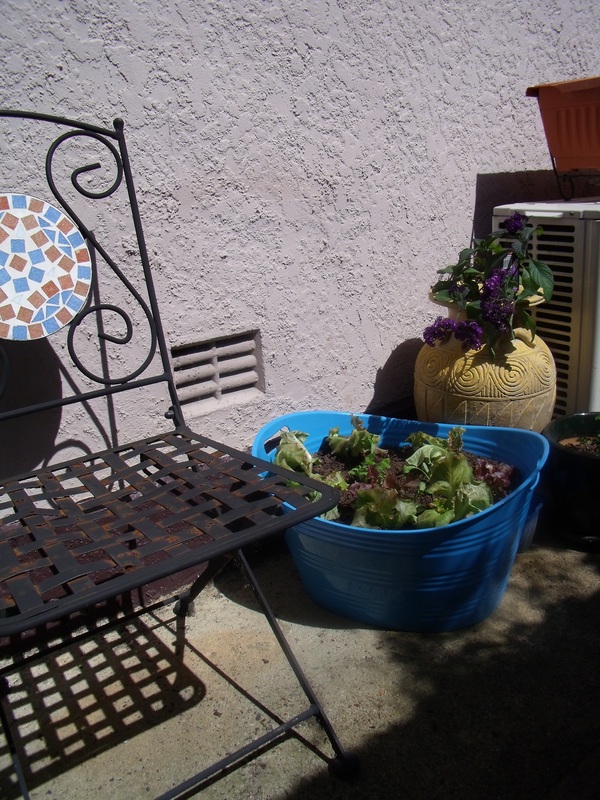 This entry was posted in Daily Life and tagged better late than never, growing lettuces in tubs, Siddhartha, Smallest garden in the world by thecontentedcrafter. Bookmark the permalink. Finally! Welcome sunshine 😀 Fantastic to get back into the garden so you can enjoy it too. Sometimes, late season is a great time to score garden deals too. Those poor greenhouses were no doubt anxious to move some product after all the poor weather of the first couple of months. I used to work in a greenhouse, They did most of their business in May and June and actually closed just after our July long weekend. Canadians seldom bother to plant up their pots or anything after then because the warm days end mid-September. I love that Orlando can hang out there with you in the sunshine too, such a nice way to spend time together. PS, I dread spiders…eeeeeck. 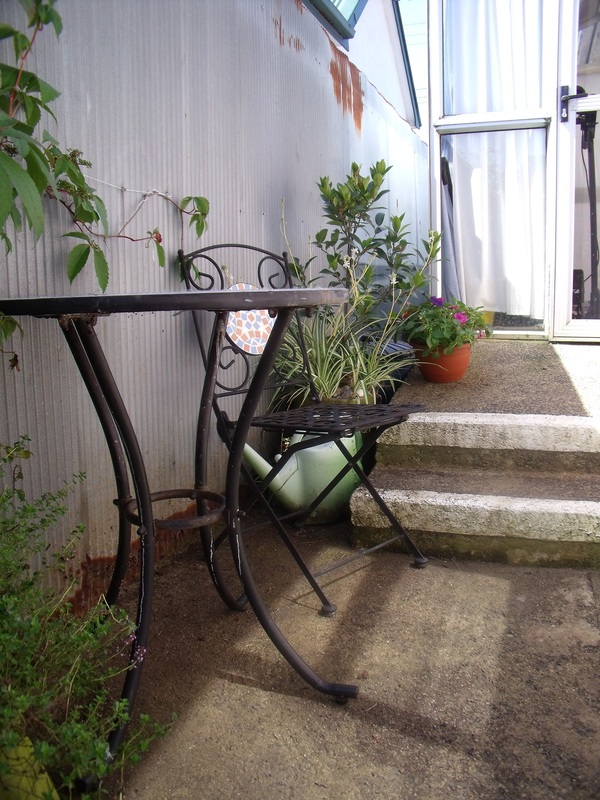 Enjoying the sun in my wee garden has become a priority each day, the great thing about a late arriving summer is that you really, really appreciate it when it finally arrives! And yes, most of what I bought came at bargain prices, an added bonus indeed! Everything has already doubled in size, I must take more photos and show the progress….Orlando tends to hang out with me wherever I am, he is more dog than cat in that regard, bless his cotton picking hat!! Yes indeedy! I love me some colour and couldn’t resist those tubs. The lettuces and spinach are growing like crazy – I’m sorry I didn’t plant more food – but at least this gets me underway and in the habit. I’m sorry about the heat and humidity – I thought your garden was looking particularly fecund in the last post – do hope you salvage something! Ah, I see your problem! Super rich soil is good for tomatoes and leafy greens and that’s about all – even the leafy greens will seed if you’re not quick in using them. Live and learn – my every day motto 🙂 Good luck with that then! Why just stick to ‘horticultural’ – apply the appellation to all corners of your life m’dear – Narf77Genius could become your new nomenclature!! I have 3 cats + 3 dogs now. I have a black cat, gray cat + black and gray tabby…can’t imagine a white one..she is like a royal cat! Are you talking real cats now? And real dogs? Or are we still in garden statue territory? If the latter I really need to see your garden! lol:-) Real Cats + Real Dogs. My middle daughter + I volunteered at a shelter for a few years, and we had dogs! tee hee:-) In my small space that would be too many statues:-) At one time we resuced 5 dogs, but two have passed on, so only 3 wonderful dogs. The cats she rescued from garages, etc.She moved out a few years ago, but did not take her buddies, but now they are our buddies. I love animals, so I don’t mind. However, I would never in my right mind have this many! Over the years they become your family + now I have senior citizen dogs to take care of-lol. I think it’s wonderful to have such a collection of companions – this is the first time in many, many years that I have lived with just one little fella – and he is a little bit like a dog in that wherever I go, he goes too. I would love to get him a friend. I have considered many times in the past three years volunteering at the SPCA or some such – but am terrified that I would end up bringing them all home with me. I used to, and I did once before – and I can’t afford to do things like that any more. So poor old Orlando is doomed to be an only cat – which is why he snuggles up to the statue cat I guess…..
You are right one does bring them home:-)It use to break my heart how people treated animals. I can’t afford to do this either forever. My oldest dog will be 14 yrs old on April Fools day + she is still doing fine, but we have to make accomodations for her during the week with special foods, medicine( pain with her arthritis), and not trip over her when she moves slowly in front of us!Being a teacher you know there are a lot of well balanced only children-tee hee, so why not cats! Yes, you are right – unfortunately mine isn’t one of them. He has been overindulged since day one and, while remaining extremely sweet and affectionate, can be a tad over-sensitive on some of life’s trifles……. And he likes being carried around like a baby. 🙂 Wouldn’t it be nice if you could pop over for a visit …. I am happy you like it too Robbie. I have spent a lot of time in it since we did our work. 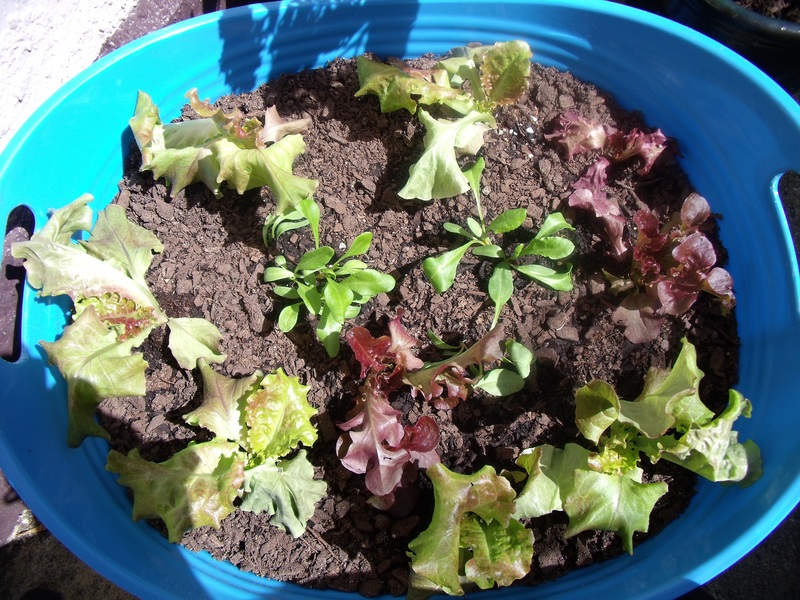 The lettuces are already obviously growing as are the flower seedlings – it doesn’t take long when the air is warm, the sun is out and water and lots of attention is given. 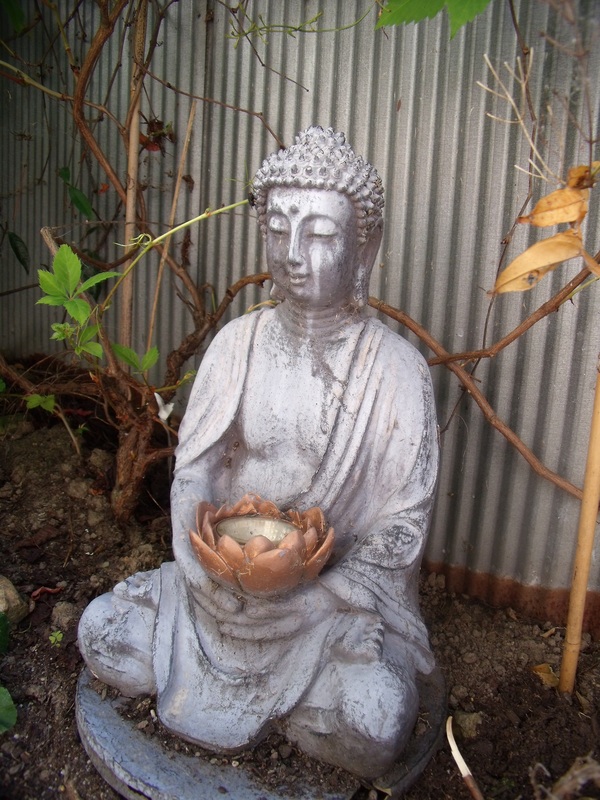 I am very fond of my Buddha and my garden cat. I’d love to get a wee statue of St Francis of Assisi too, and then I could have Sid, Frank and their cat! 🙂 Wouldn’t that be just the bees knees! Which mention reminds me,the bee activity has increased a hundredfold with the inclusion of two heliotropes into the garden – they are wild for them! The raised area where Sid lives is a bit sad really – it is soil on concrete, packed behind crumbling wood half rounds. When I came here there was nothing in this area but weeds. The soil was sour, no worms even. 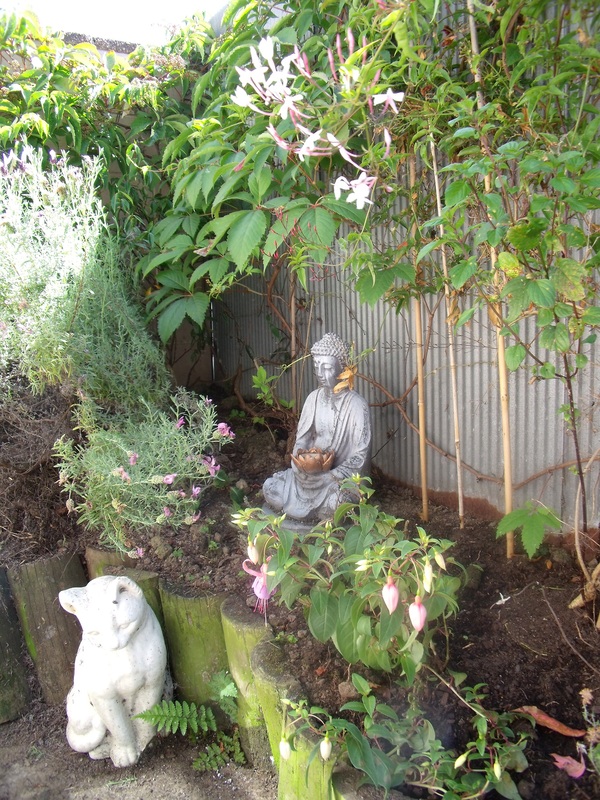 I dug compost in and was impatient to get something growing and put in the jasmine, the boston ivy and the lavenders immediately. This really didn’t give the existing soil time to revive and it is quite challenging now with all the roots to keep the soil composted and turned and fed – there are still few worms in that area. I must pay attention to it this autumn and winter and apply compost and mulch etc and help it along a tad better! See how much you all have inspired me – it’s great! It really is amazing how just a few plants can make such a difference in your bee population. I really have never had a helitrope in my garden, but have always wanted one. I tried to grow some from seed last year but that did not work. I have heard the scent is amazing! Pauline, you are a mentor to us creative souls! I look forward to your beautiful art at my home + to share with others! Oh how terrible – a beheaded Frank! Robbie! The soldiers sound very charming too – I should also love an angel – but really where would I put her? I highly recommend heliotrope ‘Black Cherry’ has the strongest scent, the other one I have, ‘Royal Marine’ has the most beautiful deep purple flower with a slightly softer scent. Planted near a resting place in your garden = heaven! Push the boat out Robbie and purchase a well grown plant, you won’t regret it! How odd. I could have sworn I commented on this post last night. I must have done it in my head instead! I’m glad I came back to read the other comments. So…lovely, lovely garden my dear. I can picture to the two of you working away under the warm sunshine, tucking in plants, dusting away cobwebs and arranging the pretty furniture. It was fun to get the panoramic view. Is your patio completely enclosed or does it exit out onto the street? Orlando steals the show once again with his clever hiding place. You can add “stealth kitty” to his list of nicknames. How I wish I could give him a good cuddle. It’s hard to tell in that third picture of him where the leaves stop and his eye begins. Clever pics. I’m so happy summer is finally sticking around. I’m glad I came back too! Thank you PJ – yes, he is quite the smartest little fellow, if a tad prima-donnerish! Is your patch small-small like mine? Mine is truly about 1.5 x 2 m and that contains a built up garden along two sides – absolutely MI-NUTE!! Mine is a bit larger, but certainly not by much. It doesn’t get much sun which makes growing vegetables rather difficult, but I should take advantage of shade loving plants. Hubby and I have black thumbs, unfortunately, but I always want to try. Hello Pauline! 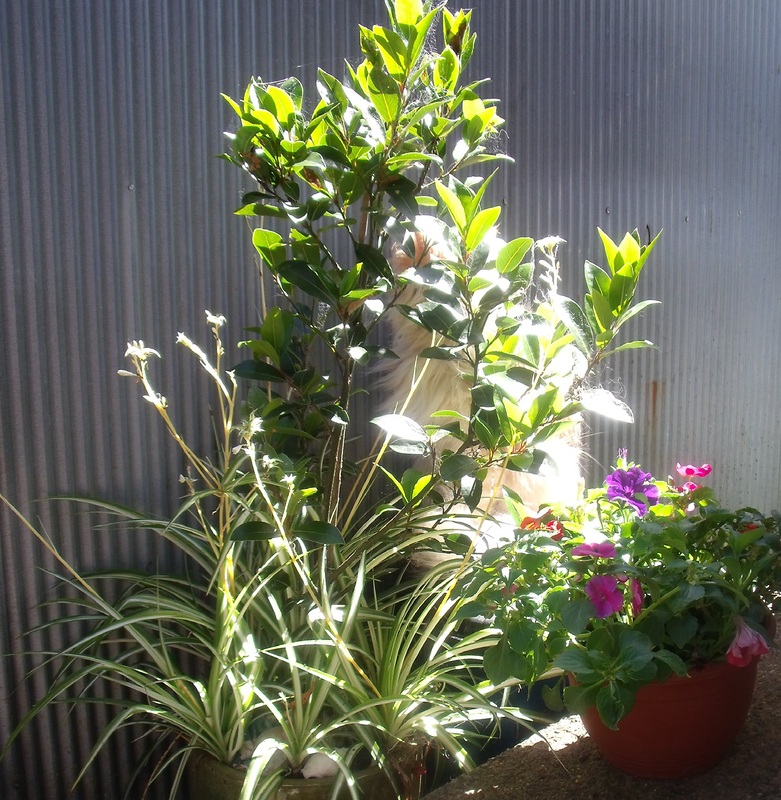 What a joy to see your sunshine and your new plantings and your tranquil place. As I look outside I see the 8 inches of snow we got last night and I long to sit in such a warm and pleasant place. Enjoy! 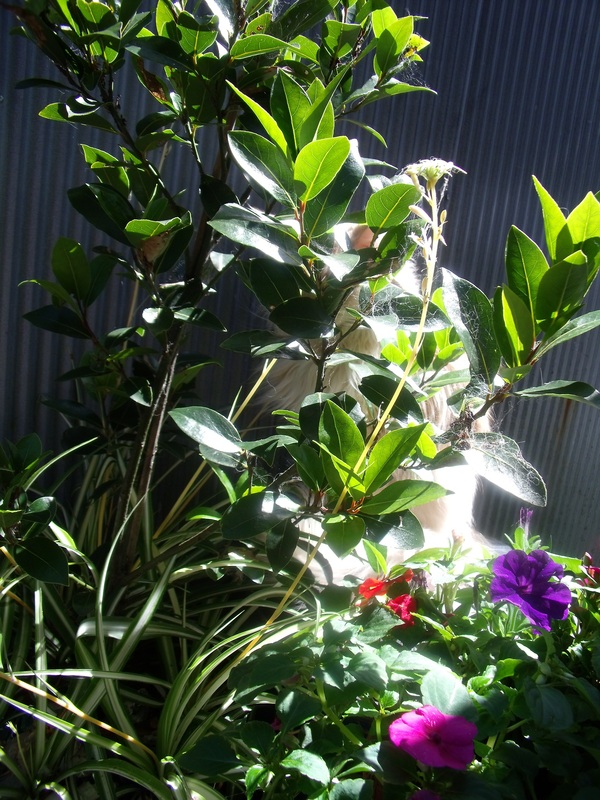 It seems almost all my US friends are under feet of snow Katy – or coping with state-wide drought – I am so glad my summer has finally arrived and I am now spending every minute I can in my tiny garden – I’m growing more and more fond of it! Our temperate climate ensures most plants can stay outdoors all year round – now and again I might lose something in a hard frost, but not too often…. Hopefully your tree will be able to return to the fresh air soon. Oh… you have some wonderful goodies in your garden. And I too, would have bought the heliotrope. I just love the aroma. Meanwhile I will gaze at your garden photos while the snow comes down (10″ and still falling). Wow, that’s a lot of snow! Isn’t it amazing how we swap around – and always so hard to imagine the opposite season when we are wherever we are….. though our climate is so temperate a snow fall is half an inch on the ground – two inches and it’s the blizzard of the century! Cats ALWAYS choose the best places. No wonder Orlando was there! Your garden is perfect and those sun rays are balm to my northern heart. Hugs across the ocean. They do don’t they – it was so cute and I wished I had managed to get a front on shot of him holding his face up to the sun – but he is a bit camera shy.